Downton Abbey is loved the world over for its fabulous costumes, beautiful scenery, wonderful characters and intricate plot lines, but what keeps millions of us coming back time after time is the stellar quality of the writing. With each stroke of his pen Julian Fellowes seems to gift us with a cuttingly dry quip from the Dowager Countess, a perfectly timed word of wisdom from Mrs Patmore or a touchingly nostalgic pronouncement from Carson. 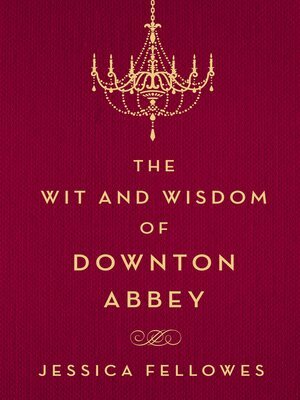 Here in the The Wit and Wisdom of Downton Abbey, Jessica Fellowes has gathered together her favorite quotes from the complete Downton Abbey oeuvre to take each of us back to the most memorable moments from the show and ensure we are armed with the very best ripostes should we ever need to chastise an impertinent lady's maid.